Check out the categories below to find your next vacation rental in Crested Butte Colorado! Located in the Rocky Mountains, our vacation rentals offer great opportunities for adventure, exploring, and relaxing. Enjoy great scenic views, hot tubs, fire pits, and beautifully crafted cozy cabins, condos, and single-family homes. Visitors often take advantage of nearby hiking and biking trails or visit Crested Butte Mountain Resort for various winter and summer activities. Whether you are looking to get outdoors, explore the town, or spend the days curled up by the fireplace, we offer a wide variety of mountain vacation rentals with great amenities. Choose from our premium Colorado vacation rentals located in Crested Butte and the surrounding areas. Looking for pet friendly lodging in Crested Butte, Colorado? Then check out Alpine Getaways selection of homes that will let you bring your pet! 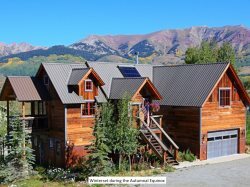 Alpine Getaways offers a wide range of lodging in Crested Butte, Colorado with our premium vacation rentals. Each rental property offers guests the best amenities that include fireplaces, private hot tubs, and more. We have lodging in Crested Butte for all types of groups with our variety of sizes and styles. No matter which of our rentals you choose, you will be met with all the comforts of home! Check out all of our rentals to choose the best lodging in Crested Butte for your next vacation! Browse and book online or call us at 970-349-0539 for any questions you might have about our available vacation homes in this beautiful mountain town. Located near the famous Crested Butte Mountain Ski Resort, our on and near mountain lodging properties offer guests the best location for their ski vacations. Why not stay close to the mountain for ease of commuting and convenience to so many other things to do? Explore these convenient properties today! Note, each of our Crested Butte on a near mountain lodging options come equipped with premium amenities and features, as well as come in a variety of sizes and styles. So no matter what kind of rental you are seeking for your visit to Crested Butte, we guarantee to have the perfect rental for you!